An utterly satisfying sequel packed with razor-sharp dialogue, a love triangle you didn't see coming, and the most charismatic dynamic duo you ever met. Now that the infuriating and irresistible Philip Digby has left town for a lead on his sister who disappeared years ago, Zoe Webster is looking forward to a quiet spring semester. She's dating a cute quarterback, hanging out with new friends, and enjoying being "a normal." Which is of course when Digby comes back. He needs Zoe's help, and not just to find his sister. Zoe can either choose to stay on her current path toward popularity, perfect SAT scores, and Princeton, or she can take a major detour with Digby, and maybe find out what that kiss he stole from her really meant. Digby and his over-the-top schemes always lead somewhere unexpected and Zoe's beginning to learn she might just like jumping into the unknown. When it comes to Digby, for Zoe at least, the choice might already be made. 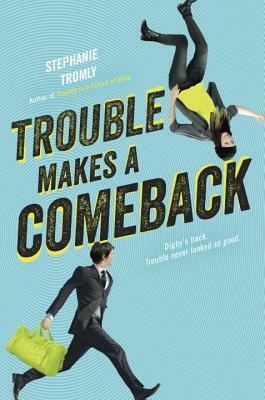 Stephanie Tromly was born in Manila, grew up in Hong Kong, graduated from the University of Pennsylvania, and worked as a screenwriter in Los Angeles. She is currently on leave from her PhD program in English Literature at the University of Toronto and lives in Winnipeg with her husband and young son. Stephanie is the author of the Trouble Is a Friend of Mine trilogy.